Jim's Tip - Who Comes First? I recently read an article in one of our trade publications written by a builder explaining in great detail why he insisted on being the initial contact with potential clients. He spent a good amount of column space demonstrating that his clients were best represented by working through his process to develop designs for their project. His belief was that only through a process such as his, would clients be able to have plans developed that would be able to be built with-in their budget. Having worked as a residential designer both independently and in the employ of several builders, I certainly understand his perspective. It is very common for clients to come into our office with grand dreams, essentially with “champagne taste and a beer budget” as the saying goes. Someone must introduce some hard cold facts into the conversation very early so that realistic expectations are set before pen or mouse are in motion. There is nothing worse than having a set of construction documents fully developed only to find out that the house is way over the client’s budget. A lot of money has been wasted including the builders’ time along with all his trade partners, bidding a useless set of plans. The point that the builder was emphasizing was that costs must be part of the discussion and controlled all the way through the design and construction process. I couldn’t agree more. 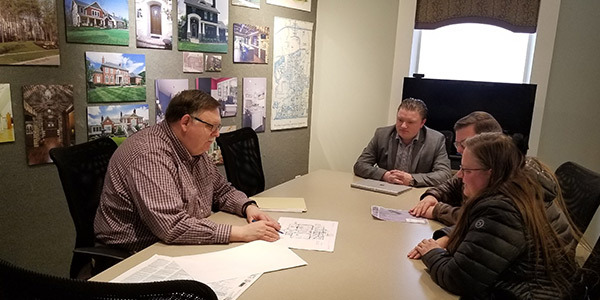 All our designers have construction management and hands on building experience which allows us to have a realistic cost perspective when initially meeting with clients. We always have a cost discussion before we get started so it really doesn’t matter who qualifies the client. The key is tracking costs at every step of the design process, from initial sketch “ballpark” pricing to final construction/contract documents. The point that I want to convey is that it really doesn’t matter who comes first if both the builder and their designer are working closely together. The resulting home will be one that the clients are thrilled to own at a cost they are comfortable with. Contact RDSto see how seamlessly we can become part of your team.